Full album of pics is here. 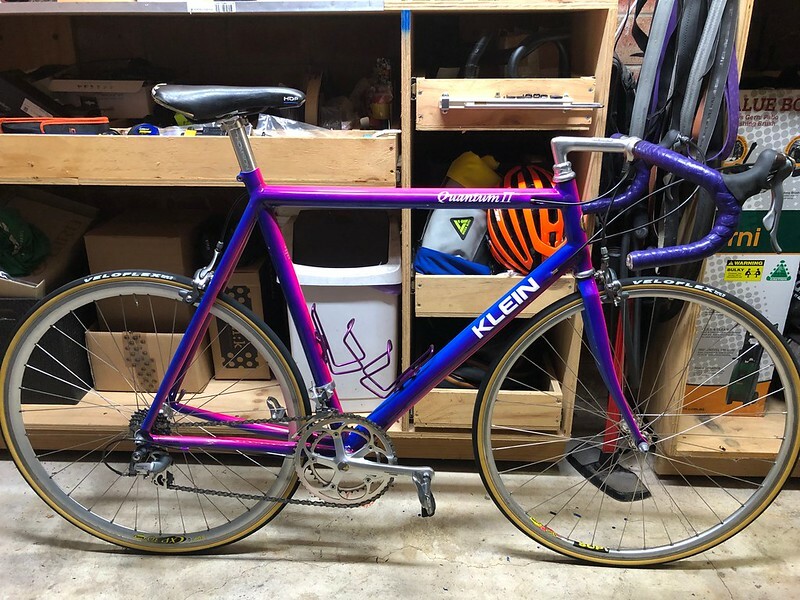 Klein Quantum II with full 8spd Shimano Tricolor groupset. 59cm top tube. Immaculate condition. Only 2/3 scratches on the frame, none of which are serious. There is one *very* small dent on the non-drive side seat stay, but it’s not an issue and doesn’t really notice (the chap I bought it from said it has been there as long as he can remember; and he bought the bike new). All of this is pictured in the folder linked above. Full original paint including colour-coded bottle cage bolts. Even the original gloss finish looks box-fresh - the bar tape when I picked it up was the original cork stuff the bike came with! It is a 1993 model. The original owner claimed circa 3000km use since new; and unused for quite some time. Given the wear and condition of the bike and entire drive train I have no reason not to believe that. The headset, BB and wheel bearings are all still beautifully smooth with loads of life remaining. Nothing is seized - the pedals, seat post and stem all free'd up very readily, so changing and/or maintaining will be no issue. I have installed a set of Shimano Claris 8spd levers (these are the same shape as Dura-Ace 9000 series levers, but work perfectly with the 600 derailleurs) which I bought to tidy up the cable setup to get them hidden and clean up the front end. I still have the original 600 levers; which are immaculate and would be supplied with the bike. The original wheels were swapped out with an interim set so that I could have the hubs rebuilt into new rims, only to find the rims I wanted are no longer available after all. As such the original 600 hubs are now separated, but will be supplied (with QRs). Consequently, I recently gambled on a set of 2008 Zipp 303 tubs (8/9/10-speed Shimano) which are now mounted on the bike (with 25c Mavic tyres). It is now wearing a brand new 100mm Cinelli Pinocchio stem (pics added). I also have the original 140mm (which I believe to be a Cinelli 1/A). The buyer will get both of these and the original Cinelli Criterium bars (it is now wearing almost new Cinelli Giro d’Italias). I will supply the original Look pedals that it came with (no cleats I'm afraid), but not the silver Shimanos pictured. The current bar tape is the fresh white Fizik stuff in the pic with the Zipps. The white Rolls saddle is only a handful of rides old. That is now also perched on a Ritchey Classic seatpost which is the same age. The original black San Marco HDP saddle and Thomson post will be supplied too. Price is AU$2250. (circa £1250, or US$1600). I'm motivated for a quick sale, but not desperate. My research indicates that framesets of this age and condition seem to go for circa AU$1200-1800 (I’ve seen one in worse condition sell for $1500 USD recently! ); so with the immaculate Shimano 600 Tricolor stuff and Zipps, I believe the price to be very fair. I’ll consider splitting and selling the frameset (with forks, BB & headset, possibly with a bar & stem combo, a sadle and a seatpost) as that will free up the parts for me to use on another frame to use as a commuter as originally planned. I'll sell the frameset for AU$1450.